Celebrity Cruises has unveiled its first-ever brand-designed cruise terminal, Terminal 25 (T25). 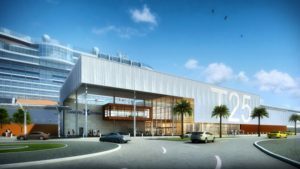 Designed to complement the line’s newest ship, Celebrity Edge, the terminal is located at Broward County’s Port Everglades in Hollywood, Florida. and the first purpose-built crew lounge of any Royal Caribbean Cruises Ltd. terminal. Scheduled for completion in late October 2018, T25 will be LEED certified and able to accommodate ships up to 1,150 feet long. It will be the new home to many Celebrity ships during their winter deployment, including Celebrity Edge, Celebrity Infinity, Celebrity Reflection and Celebrity Silhouette. When Celebrity is not using the terminal, it will be open to other cruise lines.